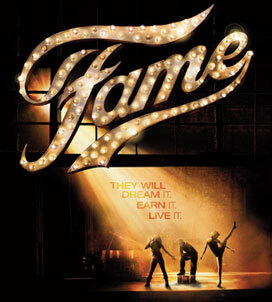 Fame, the remake of the original 1980 movie about teens hoping to be stars, rose to the top of the UK box office last weekend. It’s just one of a series of remakes coming to the big screen. Footloose is also getting a redo with heartthrob Chace Crawford in the role originated by Kevin Bacon. Battlestar Galactica and The A-Team are two that originated as television series. The extemely campy 1968 cult classic Barbarella, which starred a young Jane Fonda, will get new life breathed into it by director Robert Luketic. Several of Arnold Swarzenegger‘s films will be remade as well, including Total Recall, Red Sonja and Conan the Barbarian (this time simply titled Conan). Sherlock Holmes and Robin Hood have received the big screen treatment numerous times over the years, but originate from books, while Judge Dredd and Flash Gordon were originally comic strips. Which ones are you looking forward to seeing on the big screen? Any movies not mentioned here that should have remakes? I would love to see a movie about King Conan. I heard rumors that the movie was supposed to be made with Arnold playing an aged King Conan and Dwayne Johnson playing his son Conn.
At the time I didn’t think it would be good because I wasn’t a fan of The Rock’s acting but he has gotten alot better and after seeing his build in the Tooth Fairy trailer I think he would do the role of the sullen eyed Cimmerian proud. I’m interested in hearing some other thoughts. The Shining was awesome. I think I would enjoy a remake of that. I love anything Stephen King creates! As for all the rest mentioned…I prefer originality rather than watch the same sh!t over and over and over. i think i didnt appreciate the shining as much as i could have because its an older movie and it didnt fit in with todays standards of horror. it didnt effect (or is it affect here?) me the way i was hoping it would, but i do believe that jack nicholson is a brilliant actor. Jack Nicholson IS a brilliant actor, no question there! Nancy, do you read Stephen King books? I have mostly all of them, I absolutely love him! Read one of Tabitha’s books, and it was really good too, but haven’t picked up any more since. Indeed I do, Tributegirl. Love every one of them. I don’t get to read as often as I’d like, considering the circumstances. I also really like John Grisham. John Grisham’s books look so interesting, but I just can’t get into them, not sure why. What was your favorite SK book? Mine is The Stand, by far! Have you read the Gunslinger series? Here’s a question for the Stephen King Fans. The ending that was in The Shining with Jack Nicholson, is that the one from the book? I bring it up because I thought they had a TV movie of the Shining starring one of the guys from the old show “Wings” and I think the ending was different from the other movie. Oh! I completely forgot about that one, Earl 101!!! I guess I should rephrase what I said earlier then, LOL….I said “I love anything Stephen King creates”. I should have added “on paper”…because his version of The Shining with Steven Weber SUCKED!!! Hahahaha. Seriously though, it did! Stephen King is an amazing author but he should leave the movies to the amazing movie directors (The Shining’s Stanley Kubrick for instance). There were things that were a little off from the movie (with Jack Nicholson) as compared to the book but, the mini series was waaaaaaaaaaayyyy off. I couldn’t even stand to watch it all. Tributegirl: I haven’t read the Gunslinger series. I can’t choose a favourite, I like too many. The Stand is great, yes. Carrie, Christine, Misery, It, etc., etc. I can’t choose only one. LMAO! Dreamcatcher is on my nightstand right now. Lord only knows just when I will get to it though, but I will, hahaha. The movie Dreamcatcher sucked, but the book was good. The Gunslinger series takes a long time, I forget how many books there are, but definitely read them in order. My sister in law started with the second or third, and it was too confusing so she gave up. The Stand is definitely his best work, in my opinion!! !